Frost and Lynx�s child was born just before dusk, and the little girl-cub was beautiful, born with her mother�s blue-violet eyes and her father�s golden hair. The entire tribe celebrated; honeycakes were made, there was fish fresh from the river, and jugs of berry wine had been produced from the cache-dens. Yet in his euphoria, it had taken hours for Lynx to recognize that something was missing. Chieftess Easysinger was close by her sister Frost�s side, making sure the new mother and cubling were treated to the best of everything this night. Lynx passed his cup to Dreamberry to have it refilled with the weaver�s wine. �Where's little Briar?� he asked. �Underfoot somewhere, I�m sure,� came her wry response. As the tribe�s only child prior to Frost and Lynx�s Recognition, the boy had grown up basking in an entire tribe�s attention. His father, Hawkcall, had been killed only months after Recognizing Ice, and while Ice loved her son, she was an indifferent mother who far preferred her forge and her tools over the patient job of raising a cubling. She had been happy to leave the task to others, and there were others enough in the tribe more than happy to take it on. Lynx sipped at his wine as he strolled through the Holt proper. The music and the dancing would continue all night; the birth of a precious infant to the Holt was something they all had reason to rejoice in, and Lynx didn�t need the sweet dreamberry glow to warm him. His daughter had finally joined the world, and she was as glorious as the dawn. There had never been an elf child born as beautiful as his little girl, and there never would be another. Lynx knew that with a father�s certainty. His little girl, his little Aya, was perfect in every way, and he would never be so proud again in his life as he was this evening, with his tribe around him celebrating little Aya�s arrival. And the only thing missing from that joy was young Briar. Lynx found the boy on the far side of the holt proper, as far from sights and sounds of the celebration as the boy could safely get, with no wolf-friend yet to carry him. A fierce, angry silence met his words. Lynx kept his expression even and unconcerned, although inwardly, he was scrambling to figure the boy out. Young Briar was a child of deep waters. While his mother Ice was always affectionate with her child, she was largely indifferent to the demands of motherhood, preferring the mysteries of her metalworking craft over the raising of her own cub. And even as a newborn, young Briar had seemed equally indifferent to his mother. He fed from her breast eagerly enough, but once done, had always seemed as happy when carried by anyone other than his dam. 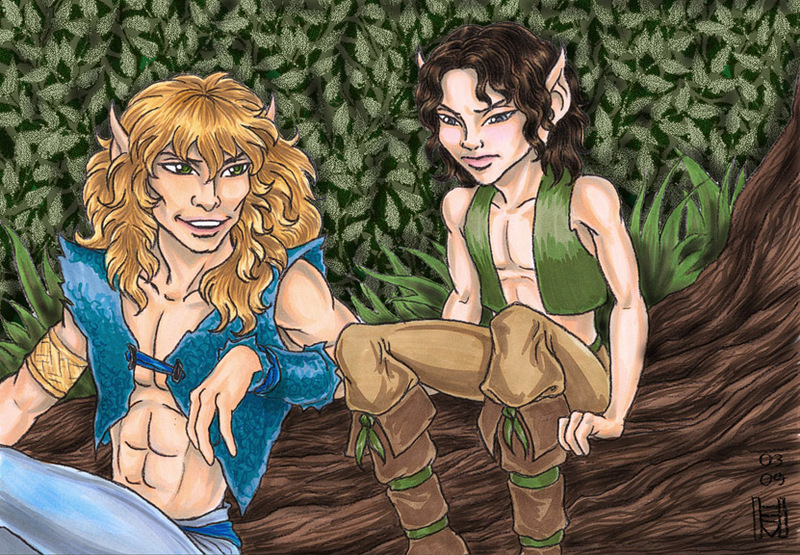 The boy was never without affection � after all, there were no orphans in a wolfrider tribe; and Briar had always seemed happy enough passed from den to den. But he was a stoic child, who seldom cried and just as seldom laughed. That he had inherited his mother�s intensity was of no question to anyone who taught the cub, as the child had a startling focus for learning the arts of woodcraft and of hunting. But there was always a distance to the boy. He didn�t like to snuggle down in anyone�s den for long, and seemed happiest roaming on his own. Ah. Suddenly it made sense. Before today, young Briar, with no other child to play with, had had no other competition for the tribe�s affection. And before today, Lynx had never had a child of his own. The birth of Lynx�s daughter meant joy for the rest of the tribe, but for young Briar, clearly it meant a threat to a child�s sense of place in the world. The boy was jealous. Lynx watched Briar out of the corner of one eye, and kept his own smile hidden. He figured he knew how to win the boy out of his jealous sulk. That had Briar�s full, unqualified attention. The boy grew still and gazed at him, pale grey eyes somber and somewhat suspicious. Lynx gave him an innocent glance, and shaped his face into a concerned expression.